After a long summer and a short but thrilling pre-qualifying race that set the grid for the new NEO season, the entry list is finally filled out and the season is about to begin. In our first class preview, this article takes a closer look at the LMP1 teams that hope to contend for overall victories. With the defending prototype class champions, Pure Racing Team, not returning this season, the obvious candidate to succeed them is the season-four runner-up, Thrustmaster Mivano Racing. Mivano brings their two entries from last season up to the P1 class, and their #3 car features the same three drivers — Marcus Hamilton, Tommaso Carlà, and Frederic Evers — who won last season’s 24 Hours of Le Mans. Mivano’s second entry, which will be driven by the likes of Gabor Mecs and José María López, will also be one to watch this season, but to win the title, they’ll have to beat their teammates. 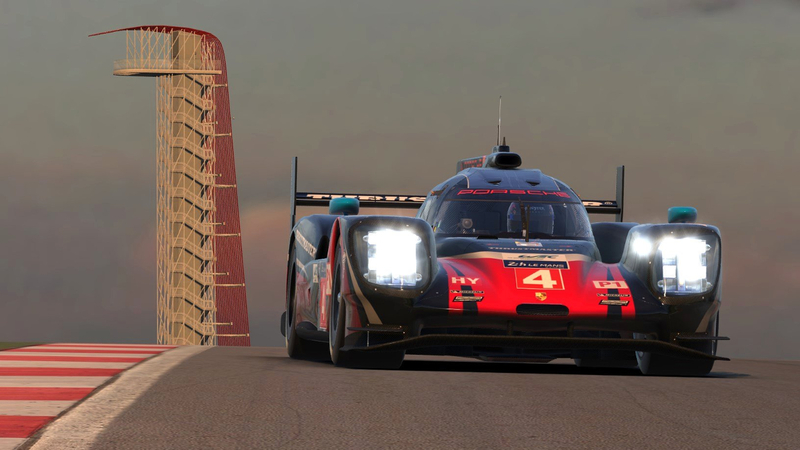 Thrustmaster Mivano Racing is set to tackle COTA and the rest of the season-five schedule. Another likely contender comes from SimRC.de, which steps up from the GT ranks to field a Porsche 919 hybrid. Their #7 car topped the first round of pre-qualifying in the P1 class and came up second in the pre-qualifying race. With a deep seven-man roster, SimRC should be a threat to win all season. The pre-qualifying race winners, Florian Krüger and Mike Nürnberg from Porsche Basel powered by Sorg eSports, will look to continue their P1 success come Sebring. 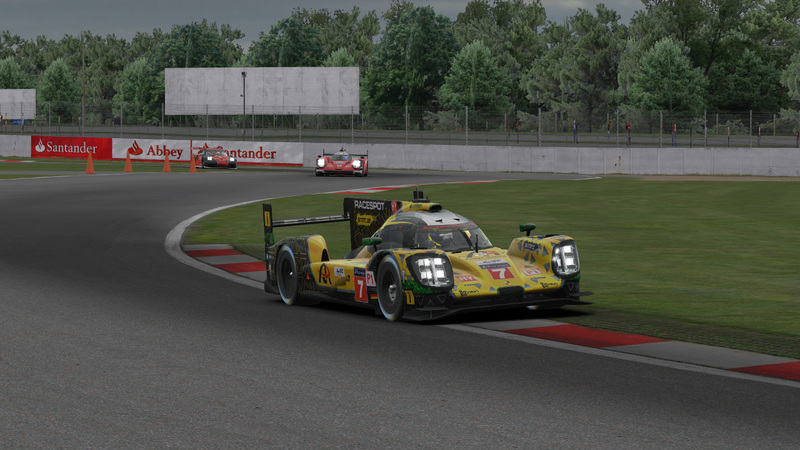 This season marks the NEO debut of the official sim racing squad for the real-world Sorg Rennsport team. After a forgettable season in the HPD, Team Chimera hopes to return to their winning ways in the P1 class. Their veteran lineup includes several drivers who have been in NES since its beginning, including Ben Tusting, Simon Trendell, and Jamie Wilson. SimRC leads the pre-qualifying race. Last season’s sixth-place finishers in the prototype standings from Teo Martín eSports have a new name — MSI eSports — but a familiar all-Spanish roster. If they can replicate their podium result from Road America last year, they could be a dark horse in the P1 class this season. 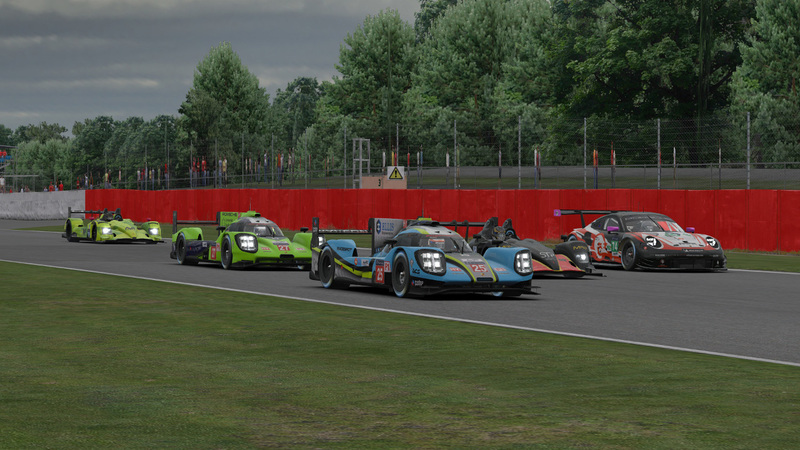 The last spot on the pre-qualifying race podium came down to a hard-fought battle between Odox Motorsport and BerlinSimSport, which have entered this season as AVA Vervatic in the P1 class. With both teams’ lineups now confirmed, we expect a similar close fight between these two all season. With some smart driving and a bit of luck, they could even be fighting for overall podiums. 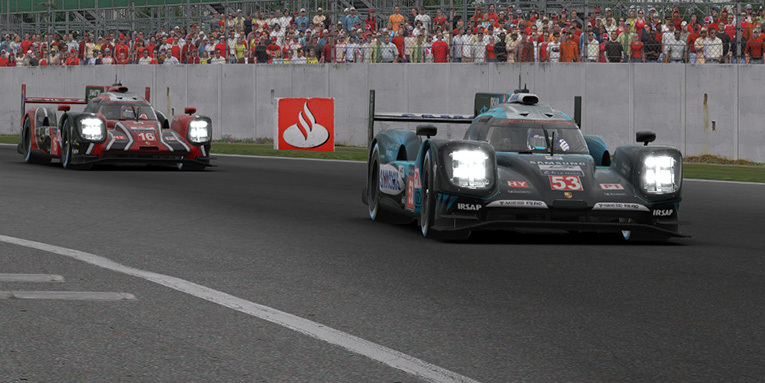 Finishing a quiet fifth place behind those two at Silverstone was SimatoK eSport. Their all-French lineup led by Julien Ribouleau could also contend for high finishes if they keep their nose clean like they did in pre-qualifying. 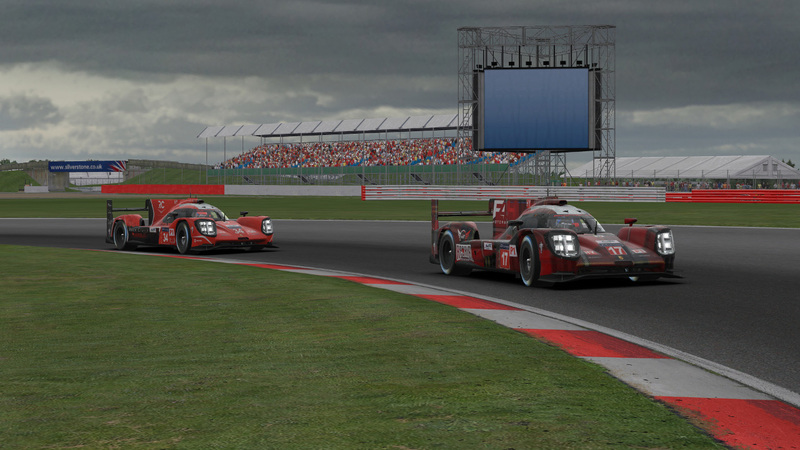 Odox and SimatoK tackle Copse corner at Silverstone. With only one of their two entries being selected for the season, Wyvern Racing combined both lineups into a single team, which will field the #25 Porsche 919. Michel de Jonge and Nick Rowland both know the ins and outs of NEO competition, while Sai Andra and Alex Ellis will break into the series this season. Although a bit of bad luck on the first lap of the pre-qualifying race dropped UI1-Positive SimRacing down the finishing order, they showed that they had the pace in PQ1, posting the fourth-best average lap time with strong stints from Doriano Ricchiuti and Samuele Romanini. In their first full NEO season, this team will hope to avoid similar early incidents and become contenders. They’re accompanied by a sister team who moved from TeamGT Freem under the UI1-Positive SimRacing banner in the off-season. Danilo Piazza and Riccardo Schiavon remain from last year’s roster, and they’ll hope to improve upon their tenth-place finish in season four. Wyvern’s Michel de Jonge and UI1-Positive SimRacing’s Doriano Ricchiuti work through traffic. Long-time NEO entrants Torrent Motorsports are back for this season, including an entry in the P1 class. While they didn’t set the world on fire in pre-qualifying, finishing ninth in both rounds, a veteran endurance driver like Norbert Leitner knows how to keep this team on track. 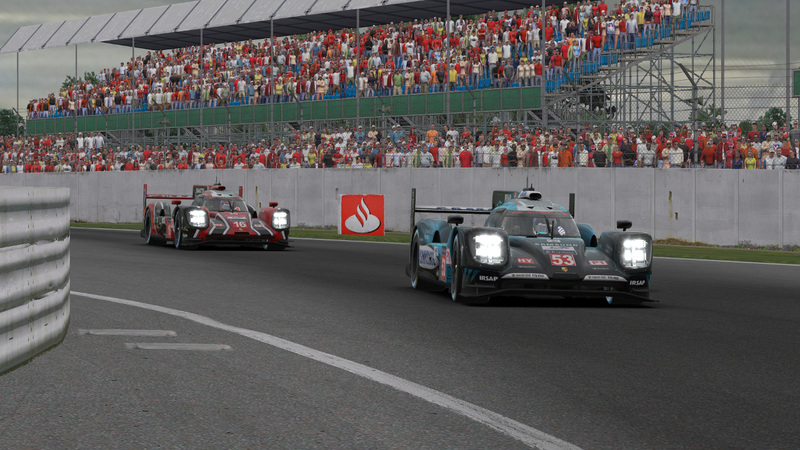 Likewise, the veteran lineup from Virtual Motorsport including the likes of Dennis Gerressen and Bas Slob can handle the ups and downs of an endurance season, but as the only team fielding the Audi R18 e-tron quattro, they’ll have their work cut out for them against their higher megajoule-generating counterparts in the Porsche. The rest of the P1 lineup includes three teams entered in NEO for the first time. F4H Motorsport and Race Clutch finished seventh and eighth, respectively, in the pre-qualifying race, while VRTeRacing rebounded from a starting-line collision to finish eleventh and earn a place on the grid. F4H Motorsport and Race Clutch will both be in the Porsche 919 this season. For all three teams — and for that matter, most of the P1 field in the NEO debut for that class — this season includes plenty of unknowns, so we’ll see where they all shake out after 60 hours of racing.